To a medieval scribe or artist, a blank page in a manuscript was fair game for writing notes or making drawings. 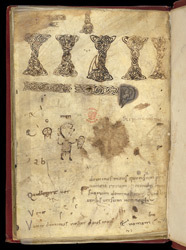 The last page of this manuscript has been nearly covered over a span of centuries with letters made by scribes testing pens or attempting copies of handwriting styles. Near the top, a fairly skilled person has drawn some interlace patterns, probably as studies for decoration in another manuscript. The crudely drawn figures may have had a serious purpose at the time, but this is impossible to deduce with confidence.